PORT CHARLOTTE, Fla. -- The Charlotte Stone Crabs dropped both games of a doubleheader against the Tampa Yankees at Charlotte Sports Park on Monday night. The Stone Crabs (18-19) nearly came back from a seven-run deficit in a 7-6 loss in Game One but never got going in a 2-0 loss in Game Two. Charlotte catcher Stephen Vogt collected hits in both games to push his hitting streak to 14 games, giving him the record for the longest hitting streak in franchise history. He broke the previous record during the first game when he went 2-for-3 with two home runs and continued the streak in the second game with a bunt single. The Stone Crabs fought back from a seven-run hole in a 7-6 loss in the first game of the twin bill after being no-hit through the first four innings by Tampa starter Andrew Backman (1-3). Crabs infielder Henry Wrigley broke up the no-hit bid in the bottom of the fifth inning with a single to left, and Vogt followed with a home run to right field to get Charlotte on the board. The longball was his second of the season and officially extended his hit streak to 13 games. The Charlotte offense kept the comeback going in the bottom of the sixth inning when Wrigley knocked a homer of his own to left field, and Vogt followed with his second blast over the right field wall. The longballs were the seventh for Wrigley and third for Vogt on the season. The Stone Crabs eventually narrowed the gap to just one run and had the tying run on third base in the bottom of the seventh inning with one out but Leslie Anderson grounded out to the pitcher and Wrigley popped out to the third baseman to end the comeback and the game. The multi-homer game from Vogt was the first for the Stone Crabs since Ian Paxton accomplished the feat on June 12 last season. Charlotte starter Matt Moore (0-5) gave up seven runs (six earned) in five innings to take his fourth consecutive loss. He walked four batters and gave up seven hits while striking out just three. In Game Two, the Stone Crabs offense struggled again and managed just four hits in a 2-0 shutout loss. Charlotte wasted a solid outing from recent addition Shane Dyer (0-1) who pitched six innings and only gave up one earned run in his debut after being promoted from Low-A Bowling Green today. The teams will continue the series tomorrow with a 7:05 p.m. first pitch at Charlotte Sports Park. Righty Nick Barnese (3-2, 3.64) will man the bump for the Crabs against fellow right-hander Graham Stoneburner (1-0, 3.00) for the Yankees. The Tuesday home game means another Seniors Eat Free Tuesday where fans 55+ receive a free hot dog, bag of chips and soft drink with the purchase of a game ticket. 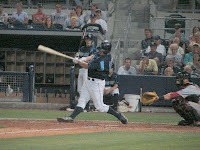 Call 941-206-HITS or visit www.StoneCrabsBaseball.com for more information.